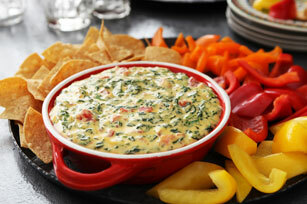 This spicy spinach dip gets its kick from salsa—and its smooth, creamy texture from VELVEETA and cream cheese. Microwave spinach in large microwaveable bowl on HIGH 5 min. Add remaining ingredients; mix well. Microwave 5 min. or until Velveeta is completely melted and mixture is well blended, stirring after 3 min. Serve with fresh veggie dippers and crisp tortilla chips. Cut Velveeta (the whole loaf) into 1/2-inch-thick slices. Then, cut each slice crosswise in both directions to make cubes. Hot dips should be discarded after sitting at room temperature for 2 hours or longer.